Product releases are dictated by what users want, so every six months to a year a new release will contain the top 10 features users want in a new release. The releases also include latest standards. RemoteView emerged from the electronic light table industry and is primary in the intelligence community. Also full motion video in the form of V-TRAC is used to handle large amounts of imagery very quickly to allow the user to manipulate the image — to roam, zoom, pan, as well as to display the image as accurately as possible. There is a softcopy image processing capability that an imagery analyst can use to determine how that image plane maps to the earth. One of the functions Imagery Analyst does is a soft copy search, so they have to search through a whole image looking for something. They may have to stitch together images because the part they’re looking for may be on a corner. For this Geospatial Solutions has a package called Virtual Mosaic. Over the last few years there have been a series of aperture radar satellites going up. To address that, Textron Systems has added a package called RVSAR. In the business model, there is core RemoteView, but there are other features for those who need them. RemoteView is traditionally delivered as a client, with a licensed key, but it’s of no use unless you have imagery. GeoCatalog is another package for the imagery analyst to connect to a large database of imagery and pull it into RemoteView and display. “Sometimes that can take a while to download and they can put it on their network drive or C drive,” said Madden. GeoCatalog allows users to create a little catalog that stores all their geospatial data in a catalog that is kept on their local drive. “I find everything I have on my C drive, that has imagery, shapefiles, elevation data, full motion video, and pull it into a local catalog to find what I need quickly and connect that to RemoteView,” said Madden. 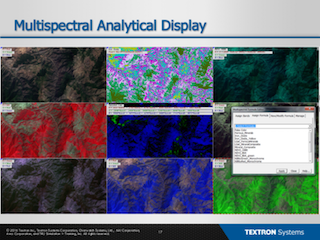 “For example, if I have an image of a month ago and today, I click on that and do a side by side comparison in RemoteView.” People like the GeoCatalog so much and wanted a server version so Textron created a GeoCatalog Server. Madden said Textron Systems have probably over 14,000 licenses of their products used around the world. When everything went cloud-based, they had to ask themselves how to best make use of the cloud for their application and not just make it a buzz word, but to break it down into the features that the cloud helps with. “We have a wealth of technology in RemoteView that we’ve built up over the years, and we are re-componentizing that into what we call Web Geospatial Cloud Services.” This application for a web service will take an image and rectify it, or one that will reduce resolution datasets, that pyramid of files that allow you to scale the image very quickly. Textron Systems has had a long relationship with the National Geospatial-Intelligence Agency (NGA) and just ended last year a five-year CRADA with Innovision. This month they signed a new 5-year CRADA That last CRADA was centered around products working within a region and comparing it with other ones. Innovision and NGA will have some internal projects going on and they’ll want to have an application connect with RemoteView. This new CRADA, is focused more along NGA Director Robert Cardillo’s cloud-based initiatives, looking at how we can move to more activity based intelligence or object based production, or structured observation type systems. Director Cardillo said that we will be inundated with imagery data, and so the question going forward when developing features is: how do we automate the mundane so we can do the things we do well? New future products will involve feature detection, and dealing with interfaces with small sats, and companies such as PlanetLabs and DocSky, and certainly, much more. This entry was posted on Friday, April 29th, 2016 at 12:50 pm. You can follow any responses to this entry through the RSS 2.0 feed. You can leave a response, or trackback from your own site.